Bundesliga | Lewandowski wins October Player of the Month! 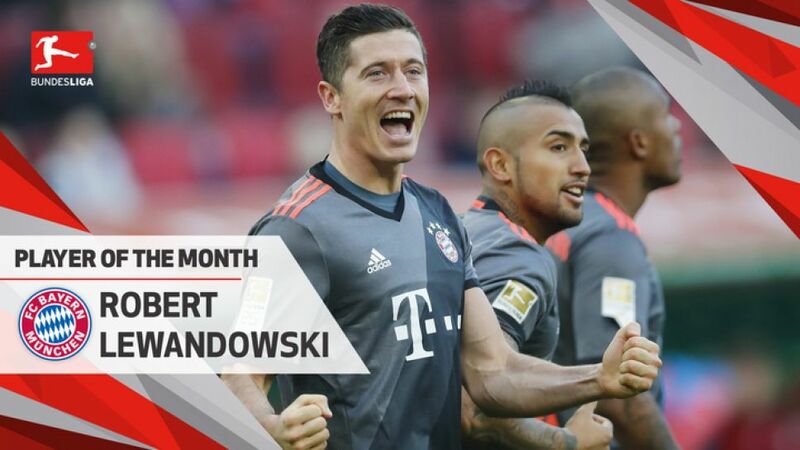 FC Bayern München's Robert Lewandowski has been voted the October Player of the Month on @Bundesliga_EN! Lewandowski wins October Player of the Month! Robert Lewandowski got back to scoring ways for FC Bayern München, bagging a brace as the Bavarians downed FC Augsburg before managing the same against PSV Eindhoven in the UEFA Champions League. Lewy has 100 Official Fantasy Bundesliga points. Add him now! Lewandowski has won the October Player of the Month competition with 43 per cent of the vote among Twitter users on @Bundesliga_EN. Anthony Modeste - Europe's leading scorer - was second, with Marco Fabian and Hakan Calhanoglu in third and fourth respectively. Lewandowski was back on the goalscoring beat as FC Bayern München beat FC Augsburg 3-1 in their regional derby on Matchday 9. Considering Lewandowski for your Official Fantasy Bundesliga side? Sign him up here! The Poland captain now has seven goals in nine Bundesliga games to his name this term. Without a goal since Matchday 3, the Bayern faithful were beginning to question what was wrong with last season's top scorer. Lewy silenced any doubters at the WWK Arena, doing enough to win your #BLPOTM vote. Has scored 13 goals in 11 games against Augsburg - more than against any other club in the Bundesliga.Ended a five-game goal drought to pull up to seven goals for the season.Now has 100 Official Fantasy Bundesliga points – the second-most in the game. Anthony Modeste’s brilliant hat-trick that fired 1.FC Köln to victory over Hamburger SV on Matchday 9 took him to the top of the goalscoring charts, not just in the Bundesliga, but throughout Europe! Want to add Modeste to your Official Fantasy Bundesliga side? Sign him up now! The Frenchman’s second-half heroics took him to 11 goals for the season so far, four goals clear in the race to be Torschützenkönig at the end of the season, with seven coming in October alone. The Billy Goats moved back into the UEFA Champions League places thanks to Modeste’s efforts. Modeste has scored every 71 minutes he has played this season.His hat-trick against HSV was his first in the Bundesliga, having scored twice on five occasions previously.Not only is the 28-year-old currently the Bundesliga's top scorer, he has more Official Fantasy Bundesliga points than any other player with 108. One goal and two assists in October.Snatched equaliser against Bayern with Eintracht down to 10 men.Now has 74 points in Official Fantasy Bundesliga. Involved in seven of Leverkusen’s 11 attempts at goal against Dortmund.Provided the assist for both goals in his side's 2-0 win.Has scored 40 Official Fantasy Bundesliga points scored with only 433 minutes played.